Updates on ways to raise funds for FREE, easy competitions, great tell-a-friend offers and more on Give As You Live, TopCashBack, Easyfundraising, eBay, and a direct link to Amazon ..
.. all so simple even adults can do it! ** It´s very quick and easy to register with easyfundraising and they will also donate £5 for everyone who signs up via a tell-a-friend link once they have raised £10. 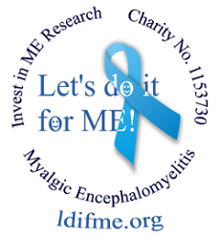 You can also raise 50p for IiME if you install the Find & Remind toolbar until the end of December. ** TopCashBack's Tell-A-Friend bonus increase has been that popular - and because they are in the festive spirit - they have decided to extend the deadline - you now have until 2nd January to help your friends save money on their online shopping and grab yourself a £20 bonus for each of them! If you're signing up to TopCashBack for the first time, please do so via Paul Kayes' Tell-A-Friend link - http://www.topcashback.co.uk - for that extra £20 donation to Invest in ME at no cost to you. Once signed up, you can spread the love by telling all your friends - Let's do it for ME! ** Now there's a direct link to shop at Amazon and support IiME at no extra cost to you - just click on the banner below when shopping at Amazon and raise much needed funds for biomedical research! Or click on the link via IiME's website - both work. Please add the Amazon link to your favourites and tell your friends and family.